All over the world, Agile methodologies are changing the ways of working and are leading to faster value realization for both the businesses and customers. The value that Agile methodologies are bringing is evident from the fast paced and the high volume of companies and organizations adopting Agile. However, the angle that we are looking at here are the personality improvements that individuals get from being in an Agile team. These are traits that team members get from working in a self organized Scrum team and will be an asset for life. These traits are visible across most flavours of Agile, but we shall stick to Scrum for the moment. Effective Improved Communication: Scrum puts power into your hands as a team member. To exercise this power, you have to talk and express yourself in planning and estimation sessions, make your voice heard in daily stand-up meetings and voice your opinions in Retrospectives. Scrum’s rituals are all about being heard without being dominant. Initially, it might be hard for some team members to lose their inhibition, but Scrum’s daily stand-ups, planning meetings and retrospectives urge each one to open up and participate. In a positive way, team members are forced to open up in a trusted team environment and over time, this gives confidence to individuals to be more expressive in bigger groups and forums. Voila, Scrum has made you a better public speaker. 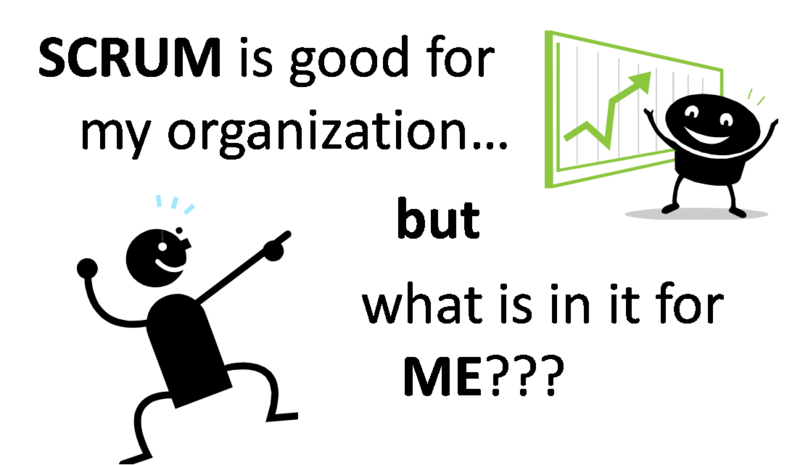 See the other person’s perspective: A team composition in Scrum consists of subject matter experts (SMEs) in Development, Testing, etc. As they plan together and work together Sprint after Sprint, they orient themselves towards the Sprint goal each time. With this, once a person is done with his/her task, he/she is now looking to pick up and contribute towards any other task that needs to be completed to meet the Sprint goal. The team member is picking up new cross functional skills and looking at things in a new perspective along with contributing towards the Sprint goal. Development and testing silos are broken and the team becomes self organized. Each person is able to understand and appreciate the other’s views and experience. This experience teaches us to think more broadly when we face a situation in life where instead of criticizing a person who holds a different perspective, we try to put ourselves in his/her shoes and think from their perspective. Though this is no rocket science, the experience from working in an Agile cross functional team allows us to pause and listen to a perspective that could be valid and totally different. Do let us know how your personality has gained by working in an Agile environment. This entry was posted in Agile, Leadership, Management, Personality development, Product Management, self improvement, User Experience and tagged Agile, Agile management, Cross-functional team, Personality, Ralph Waldo Emerson, Retrospective, Scrum, Self improvement, Sprint, Team on February 27, 2013 by Sampath Prahalad.